You are cordially invited to attend the 2019 Annual Meeting of Stockholders (the "Annual Meeting") of Universal Technical Institute, Inc. (the “Company,” “UTI,” “we,” “us” or “our”), to be held at 8:00 a.m. local time on Thursday, February 28, 2019, at our offices located at 16220 North Scottsdale Road, Suite 500, Scottsdale, Arizona 85254. We have attached a notice of meeting and a proxy statement that contain details of the business to be conducted at the Annual Meeting. Whether or not you attend the Annual Meeting, it is important that your shares be represented and voted at the meeting. Therefore, I urge you to promptly vote and submit your proxy before the meeting so that your shares will be represented and voted at the meeting even if you cannot attend in person. On behalf of the Board of Directors, I would like to express our appreciation for your continued interest in the affairs of UTI. We look forward to seeing you at the Annual Meeting. 1. To elect three directors to the Board of Directors to serve for a term of three years or until their respective successors are elected and qualified. To ratify the appointment of Deloitte & Touche LLP as the Company’s independent registered public accounting firm for the year ending September 30, 2019. 3. To consider and act upon such other business as may properly come before the meeting. Only stockholders of record at the close of business on January 2, 2019 are entitled to receive notice of and to vote at the meeting. A list of stockholders entitled to vote will be available for examination at the meeting by any stockholder for any purpose germane to the meeting. The list will also be available for the same purpose for 10 days prior to the meeting at our principal executive offices at 16220 North Scottsdale Road, Suite 500, Scottsdale, Arizona 85254. To obtain directions to attend the Annual Meeting and vote in person, please call Investor Relations at (623) 445-9500. Important Notice Regarding the Availability of Proxy Materials for the Stockholder Meeting to Be Held on February 28, 2019. The Proxy Statement and the Company’s Annual Report on Form 10-K for fiscal year ended September 30, 2018 are available electronically at http://www.envisionreports.com/uti. WHETHER OR NOT YOU PLAN TO ATTEND THE MEETING, YOU ARE REQUESTED TO SIGN, DATE AND RETURN THE PROXY AS PROMPTLY AS POSSIBLE. YOUR PROXY IS BEING SOLICITED BY THE COMPANY’S BOARD OF DIRECTORS. This Proxy Statement is furnished in connection with the solicitation by the Board of Directors (the “Board”) of Universal Technical Institute, Inc. (the “Company,” “UTI,” “we,” “us” or “our”), of proxies for use in voting at the 2019 Annual Meeting of Stockholders (the “Annual Meeting”) to be held at 8:00 a.m. local time on February 28, 2019 at our offices located at 16220 North Scottsdale Road, Suite 500, Scottsdale, Arizona 85254, and any adjournment or postponement thereof. On or about January 17, 2019, proxy materials for the Annual Meeting, including this Proxy Statement and the Company’s Annual Report on Form 10-K for the fiscal year ended September 30, 2018 (the “2018 Annual Report”), are being made available to stockholders entitled to vote at the Annual Meeting. The date of this Proxy Statement is January 14, 2019. In accordance with rules adopted by the Securities and Exchange Commission (the “SEC”), except for stockholders who have requested otherwise, we have generally mailed to our stockholders a Notice of Internet Availability of Proxy Materials (the “Notice of Internet Availability”). The Notice of Internet Availability provides instructions either for accessing our proxy materials, including this Proxy Statement and the 2018 Annual Report, at the website address referred to in the Notice of Internet Availability, or for requesting printed copies of the proxy materials by mail or electronically by e-mail. If a stockholder would like to receive a paper or e-mail copy of our proxy materials either for this Annual Meeting or for all future meetings, such stockholder should follow the instructions for requesting such materials included in the Notice of Internet Availability we mailed to our stockholders. We will bear the cost of soliciting proxies. Copies of solicitation material may be furnished to brokers, custodians, nominees and other fiduciaries for forwarding to beneficial owners of shares of common stock, and normal handling charges may be paid for such forwarding service. We may solicit proxies by mail or by personal interview, telephone and other electronic communication by our officers and other management employees, who will receive no additional compensation for their services. Any stockholder giving a proxy pursuant to this solicitation may revoke it at any time prior to exercise of the proxy by giving written notice of such revocation to our Secretary at our executive offices at 16220 North Scottsdale Road, Suite 500, Scottsdale, Arizona 85254, or by attending the Annual Meeting and voting in person. of all of our voting stock outstanding at the close of business on June 24, 2016. As a result, the shares of Series A Preferred Stock are entitled to an aggregate of 1,289,576 votes on each matter voted upon. Votes may not be cumulated. As such, the total number of shares entitled to vote at the Annual Meeting is 26,654,990. The presence, in person or by proxy relating to any matter to be acted upon at the Annual Meeting, of the holders of a majority of the outstanding shares of common stock will constitute a quorum for purposes of the Annual Meeting. For purposes of the quorum requirement and the discussion below regarding the vote necessary to take stockholder action, stockholders of record who are present at the Annual Meeting in person or by proxy and who abstain are considered stockholders who are present and entitled to vote and they count toward the quorum. Internet. A proxy can be submitted over the internet to vote shares at the Annual Meeting by following the instructions provided either in the Notice of Internet Availability or on the proxy card or voting instruction form if a printed set of proxy materials were requested and received. Telephone. If a printed set of proxy materials were requested and received, a proxy can be submitted over the telephone to vote shares at the Annual Meeting by following the instructions provided on the proxy card or voting instruction form enclosed with the proxy materials received. If only a Notice of Internet Availability was received, a proxy can be submitted over the telephone to vote shares by following the instructions at the internet website address referred to in the Notice of Internet Availability. Mail. If a printed set of proxy materials were requested and received, a proxy can be submitted by mail to vote shares at the Annual Meeting by completing, signing and returning the proxy card or voting instruction form enclosed with the proxy materials received. Submissions of proxy via telephone or internet must be received by 11:59 p.m. Eastern Time on February 27, 2019 in order for the shares to be voted at the Annual Meeting. However, a stockholder of record who received a printed copy of the proxy materials may instead mark, sign, date and return the proxy card so that it is received by the Company before the polls close at the Annual Meeting in order for shares to be voted at the Annual Meeting. Stockholders of shares held in street name must comply with the deadlines included in the voting instructions provided by the bank, broker or other nominee that holds the shares. Brokers, banks or other nominees that hold shares of common stock in “street name” for a beneficial owner of those shares typically have the authority to vote in their discretion if permitted by the stock exchange or other organization of which they are members. Brokers, banks and other nominees are permitted to vote the beneficial owner’s proxy in their own discretion as to certain “routine” proposals when they have not received instructions from the beneficial owners, such as the ratification of the appointment of Deloitte & Touche LLP as our independent registered public accounting firm for the fiscal year ending September 30, 2019. If a broker, bank or other nominee votes such “uninstructed” shares for or against a “routine” proposal, those shares will be counted towards determining whether or not a quorum is present and are considered entitled to vote on the “routine” proposals. However, where a proposal is not “routine,” a broker, bank or other nominee is not permitted to exercise its voting discretion on that proposal without specific instructions from the beneficial owner. These non-voted shares are referred to as “broker non-votes” when the nominee has voted on other non-routine matters with authorization or voted on routine matters. These shares will be counted towards determining whether or not a quorum is present, but will not be considered entitled to vote on the “non-routine” proposals. Broker non-votes will not affect the outcome of any matter being voted on at the meeting, assuming that a quorum is obtained. Abstentions, on the other hand, have the same effect as votes against the matter, although abstentions will have no effect on the election of directors because approval of a percentage of shares present or outstanding is not required for that proposal. Election of Directors. Our Bylaws provide that in a non-contested election, each director nominee must be elected by the affirmative vote of the majority of the votes cast with respect to that director’s election. A “majority of the votes cast” means that the number of votes “FOR” a director nominee must exceed the number of votes “AGAINST” that director nominee. Accordingly, abstentions will have no effect on the election of a director. Pursuant to our Corporate Governance Guidelines, the Board of Directors expects any director nominee who is an incumbent director and is not re-elected to promptly tender his or her resignation, and the Board of Directors, excluding the director who tenders his or her resignation, must promptly decide whether to accept or reject the resignation. Uninstructed shares are not entitled to vote on the election of directors. Ratification of the Appointment of the Independent Registered Public Accounting Firm. The affirmative vote of a majority of the shares of common stock present or represented at the Annual Meeting and entitled to vote is required to approve the proposal to ratify the appointment of Deloitte & Touche LLP as our independent registered public accounting firm for the fiscal year ending September 30, 2019. Uninstructed shares are entitled to vote on this matter. Abstentions will have the same effect as a vote against ratification of the appointment of our independent registered public accounting firm. Any stockholder entitled to vote on any matter may vote part of such stockholder’s shares in favor of the proposal and refrain from voting the remaining shares or, except with respect to the election of directors, may vote the remaining shares against the proposal; but if the stockholder fails to specify the number of shares which the stockholder is voting affirmatively or otherwise indicates how the number of shares to be voted affirmatively is to be determined, it will be conclusively presumed that the stockholder’s approving vote is with respect to all shares which the stockholder is entitled to vote. If any other matters are properly presented at the Annual Meeting for consideration, including, among other things, consideration of a motion to adjourn the meeting to another time or place, the individuals named as proxies and acting thereunder will have discretion to vote on those matters according to their best judgment to the same extent as the person delivering the proxy would be entitled to vote. If the Annual Meeting is postponed or adjourned, a stockholder’s proxy will remain valid and may be voted at the postponed or adjourned meeting. A stockholder still will be able to revoke the stockholder’s proxy until it is voted. As of the date of this Proxy Statement, the Board of Directors did not know of any matters other than those described in this Proxy Statement to be presented at the Annual Meeting. Proxies properly executed and received by the Company prior to the Annual Meeting and not revoked will be voted as directed therein on all matters presented at the Annual Meeting. If you submit a proxy or voting instruction form by internet, telephone or mail without giving specific voting instructions on one or more matters listed in the notice for the meeting, your shares will be voted as recommended by our Board on such matters, and as the proxyholders may determine in their discretion with respect to any other matters properly presented for a vote at the meeting. Board of Directors Structure. Our Board of Directors currently has 11 members, the majority of whom are independent directors. The Board of Directors is divided into three classes. Directors in each class serve three-year terms. At each annual meeting, the term of one class expires. Currently, Messrs. Blaszkiewicz, Conrad and DeVincenzi and Ms. McWaters serve as Class I Directors, Messrs. Lennox and Penske and Ms. Srere serve as Class II Directors and Messrs. Paige, Trammell and White serve as Class III Directors. Mr. Shackelton serves as designee of the holders of Series A Preferred Stock. Nominees for Election at this Annual Meeting. The Board of Directors, acting on the recommendation of the Nominating and Corporate Governance Committee, has nominated Messrs. Paige, Trammell and White for re-election as Class III Directors, each to serve a three-year term ending in 2022, or until the director’s successor is duly elected. It is intended that the votes represented by the proxies at the Annual Meeting will be cast for the election of Messrs. Paige, Trammell and White as directors. Director Nominees. The following table and text presents information as of the date of this Proxy Statement concerning the nominees for election as directors, including in each case their current membership on committees of the Board of Directors, year first elected a director and principal occupations or affiliations during the last five years, other directorships currently held or held during the past five years and the experiences, qualifications, attributes or skills that each nominee and director brings to our Board of Directors. We believe that each of the director nominees possesses an ability, as demonstrated by recognized success in his or her field, to make meaningful contributions to the Board’s oversight of the business and affairs of the Company. Dr. Roderick R. Paige has served as a director on our Board of Directors since September 2010. Dr. Paige served as the Interim President of Jackson State University from October 2016 to July 2017. Dr. Paige was a founder of the Chartwell Education Group, LLC, an education consulting firm, and served as its Chairman from 2005 to 2009. Dr. Paige has also served as Senior Advisor to Higher Ed Holdings, LLC since 2005. Dr. Paige served as the United States Secretary of Education from 2001 to 2005 and was a Public Policy Scholar at the Woodrow Wilson International Center for Scholars in 2005. Dr. Paige also served as a director of News Corporation during the last five years and was a member of its compensation committee. Dr. Paige also has significant experience in the education industry, including 10 years as the dean of a college of education, four years as trustee of a 200,000 student school district and approximately seven years as the Superintendent of Schools of the Houston Independent School District. Dr. Paige received his doctorate and masters in health and physical education from Indiana University and his BS from Jackson State University. Dr. Paige brings to the Board of Directors governmental regulatory and leadership experience and contacts in the education industry. Kenneth R. Trammell has served as a director on our Board of Directors since June 2011. Mr. Trammell served as an Executive Vice President of Tenneco Inc., a publicly traded manufacturer of vehicle components and systems, from July 2018 until his retirement in December 2018, as the Chief Financial Officer from September 2003 until June 2018, and as Controller from 1997 through 2003. Prior to joining Tenneco in 1996, Mr. Trammell spent 12 years with the international public accounting firm of Arthur Andersen LLP. Mr. Trammell received a BBA in accounting from the University of Houston. Mr. Trammell has significant business experience in the original equipment and aftermarket automotive parts industry for more than 20 years. He also has considerable experience in financial reporting, accounting, internal controls, capital markets transactions, investor relations and operations finance. Mr. Trammell qualifies as an audit committee financial expert under SEC guidelines. John C. White has served as a director on our Board of Directors since 1997. Mr. White served as Chairman of our Board of Directors from October 2005 until December 2013. From October 2003 to September 2005, Mr. White served as our Chief Strategic Planning Officer and Vice Chairman. From April 2002 to September 2003, Mr. White served as our Chief Strategic Planning Officer and Co-Chairman of our Board of Directors. From 1997 to March 2002, Mr. White served as our Chief Strategic Planning Officer and Chairman of our Board of Directors. Mr. White served as the President of Clinton Harley Corporation (which operated under the name Motorcycle Mechanics Institute and Marine Mechanics Institute) from 1977 until it was acquired by UTI in 1998. Prior to 1977, Mr. White was a marketing representative with International Business Machines Corporation. Mr. White was appointed by the Arizona Senate to serve as a member of the Joint Legislative Committee on Private Regionally Accredited Degree Granting Colleges and Universities and Private Nationally Accredited Degree Granting and Vocational Institutions in 1990. He was appointed by the Governor of Arizona to the Arizona State Board for Private Postsecondary Education, where he was a member and Complaint Committee Chairman from 1993-2001. Mr. White received a BS in Engineering from the University of Illinois. Mr. White has experience in the postsecondary technical education services industry and has experience involving accreditation issues. Mr. White has assisted with our strategic planning, both as a director and as an employee. Continuing Directors. The terms of Messrs. Blaszkiewicz, Conrad and DeVincenzi and Ms. McWaters are scheduled to end in 2020, and the terms of Messrs. Lennox and Penske and Ms. Srere are scheduled to end in 2021. Mr. Shackelton serves as designee of the holders of Series A Preferred Stock. For further information on the Series A Preferred Stock designee, see “Series A Preferred Stock Director Designee” below. David A. Blaszkiewicz, age 50, has served as a director on our Board of Directors since December 2011. Mr. Blaszkiewicz has served as the Chief Executive Officer of Invest Detroit, a leading economic development organization, and its predecessor companies since November 2014 and as President of Invest Detroit since 2001. Mr. Blaszkiewicz served as President and Chief Executive Officer of Downtown Detroit Partnership, Inc., a private/public partnership of corporate and civic leaders engaged in key community revitalization efforts, from February 2011 to June 2014. In addition, Mr. Blaszkiewicz currently serves on the board of a number of non-profit organizations, including the national New Markets Tax Credit Coalition, Detroit’s Downtown Development Authority, M-1 RAIL, Detroit Economic Growth Corporation and Detroit Community Loan Fund. Mr. Blaszkiewicz also served as Director of Finance and Secretary/Treasurer of Detroit Renaissance, Inc., an organization of CEOs now known as Business Leaders for Michigan, from 1994 through 2001. Mr. Blaszkiewicz received a BS in Business from Wayne State University and received his MBA in 1998 from Michigan State University. Mr. Blaszkiewicz brings to the Board significant financial, commercial real estate and development expertise as well as municipal and private investment experience. Conrad A. Conrad, age 72, has served as a director on our Board of Directors since February 2004, also serving as our lead director from December 2013 to September 2017, as the Chairman of the Audit Committee from 2004 to 2012 and as a member of the Compensation Committee from 2004 to 2015. Mr. Conrad served as a director of Rural/Metro Corporation until June 2011 and as a director of Fender Musical Instruments Corporation until April 2014. Mr. Conrad was employed with The Dial Corporation from August 2000 to October 2005, where he served as Executive Vice President and Chief Financial Officer. Prior to this, Mr. Conrad worked for 25 years with Quaker State Corporation, a leading manufacturer of branded automotive and consumer products and services, where he held multiple positions, most recently Vice Chairman and Chief Financial Officer. Mr. Conrad received an AB in Accounting from The College of William & Mary. As a former chief financial officer for a public company, Mr. Conrad has experience in finance and accounting, particularly as it applies to public companies such as UTI. His prior positions with Quaker State gave him insight into the automotive products and services market. Mr. Conrad also served as the chairman of the board of Rural/Metro Corporation, which experience aids his service to our Board of Directors. Mr. Conrad qualifies as an audit committee financial expert under SEC guidelines. Robert T. DeVincenzi, age 59, has served as a director on our Board of Directors since April 2017 and has served as the Chairman of our Board of Directors since September 2017. Mr. DeVincenzi has served as a non-executive member of the Board of Directors of Redflex Holdings Limited, which focuses on road, vehicle and pedestrian safety products and services, and as Chairman of the Risk and Compliance Committee since 2014. From 2012 to 2014, he served as Chief Executive Officer of Redflex Holdings Limited. Additionally, Mr. DeVincenzi is a principal partner in Lupine Ventures, a business advisory firm that provides strategic consulting and corporate development advisory services, since 2014. Mr. DeVincenzi has also served as an Adjunct Professor of Entrepreneurship and Business Ethics at California State University, Monterey Bay since 2014. From 2008 to 2012, Mr. DeVincenzi served as President and Chief Executive Officer of LaserCard Corporation, a global biometric identification systems business. Prior to his position at LaserCard Corporation, Mr. DeVincenzi held positions in a variety of high technology enterprises, including Solectron, Inc., Inkra Networks Inc. and Ignis Optics Inc. Mr. DeVincenzi served on the Board of IBIS Healthcare from January 2015 to May 2017. Mr. DeVincenzi received a Master of Arts degree from Gonzaga University in Organizational Leadership, a Bachelor of Science degree in Business Administration from California State University, San Luis Obispo and has completed various executive educations programs at Duke University, Northwestern University and Massachusetts Institute of Technology. Mr. DeVincenzi is a certified public company director (ACCD) and has completed Directors College at Stanford University. Mr. DeVincenzi brings to the Board of Directors significant business leadership and strategy development experience as well as public company board expertise. Mr. DeVincenzi qualifies as an audit committee financial expert under SEC guidelines. Lieutenant General William J. Lennox, Jr. (USA Ret. ), age 69, has served as a director on our Board of Directors since January 2014. Mr. Lennox has served as Chief Executive Officer of Lennox Strategies, LLC, a consulting company and personal business venture, since 2012. Mr. Lennox served as President of Saint Leo University from July 2015 to June 2018. From 2006 to 2012, Mr. Lennox served as Senior Vice President, Washington, D.C., for Goodrich Corporation, a Fortune 500 aerospace firm. Prior to his position at Goodrich Corporation, Mr. Lennox served approximately 35 years in the United States Army, culminating as Superintendent of the United States Military Academy at West Point. Mr. Lennox currently serves on the Board of Princeton Power Systems, a privately held manufacturer of advanced power conversion products and alternative energy systems. Mr. Lennox received a bachelor’s degree in international affairs from the United States Military Academy at West Point, as well as a master’s degree and Ph.D. in literature from Princeton University. Mr. Lennox’s exceptional military career and his expertise in developing and managing strategic relationships between the private sector and government entities brings a unique set of experiences and capabilities to the Board. Kimberly J. McWaters, age 54, has served as our Chief Executive Officer since October 2003, as President since September 2016 and as a director on our Board of Directors since 2005. Ms. McWaters served as Chairman of our Board of Directors from December 2013 to September 2017, served as our President from 2000 to March 2011 and previously served on our Board of Directors from 2002 to 2003. From 1984 to 2000, Ms. McWaters held several positions with UTI, including Vice President of Marketing and Vice President of Sales and Marketing. Ms. McWaters has also served as a director Mobile Mini, Inc. since August 2014 and as a director of Penske Automotive Group, Inc. since December 2004. Ms. McWaters received a BS in Business Administration from the University of Phoenix. As a long-time employee of UTI, Ms. McWaters brings to the Board of Directors an understanding of the organization and experience in the postsecondary technical education services industry. Roger S. Penske, age 81, has served as a director on our Board of Directors since 2002. Mr. Penske has served as Chairman of the Board of Directors and Chief Executive Officer of Penske Automotive Group, Inc., a publicly-traded automotive retailer, since 1999. Mr. Penske has also been Chairman of the Board of Directors and Chief Executive Officer of Penske Corporation since 1969. Mr. Penske also serves as a director of Business Leaders for Michigan and Downtown Detroit Partnership. Mr. Penske has executive management experience in the automotive industry and experience as a public company director. Mr. Penske brings to the Board of Directors high-level connections to various automotive companies and extensive experience in and understanding of the automotive retail industry. Christopher S. Shackelton, age 39, has served as a director on our Board of Directors since June 2016. Mr. Shackelton is co-founder and managing partner of Coliseum Capital Management, LLC (“CCM”). Mr. Shackelton has served as Chairman of the Board of Providence Service Corp. since November 2012 and has served on its board of directors since July 2012. Mr. Shackelton has also served as a director of BioScrip, Inc. since March 2015, a director of Lazydays Holdings, Inc. since March 2018, and as a director of a number of privately held companies. Previously, Mr. Shackelton was Chairman of Rural/Metro Corp, from December 2010 to June 2011 and served on the board of Advanced Emissions Solutions, Inc. from July 2014 to June 2016, of Interstate Hotels & Resorts, Inc., from February 2009 through March 2010, and of LHC Group, Inc., from November 2012 to August 2017. Prior to forming CCM, Mr. Shackelton worked at Watershed Asset Management and Morgan Stanley & Co. He received a bachelor's degree in economics from Yale University. Mr. Shackelton brings to the Board of Directors significant financial, investing, and accounting experience in addition to his experience serving on the boards of other public companies. Linda J. Srere, age 63, has served as a director on our Board of Directors since 2005. Ms. Srere is a marketing and advertising consultant. From January 2000 to November 2001, she served as President of Young & Rubicam Advertising, a worldwide advertising network. From September 1998 to January 2000, Ms. Srere served as Vice Chairman and Chief Client Officer of Young & Rubicam Inc. (“Y&R”). From January 1997 to September 1998, she served as President and CEO of Y&R’s New York office. Ms. Srere joined Y&R in September 1994 as Executive Vice President and Director of Business Development. Ms. Srere served as the Chairman of advertising agency Earle Palmer Brown New York from 1992 to 1994, and served as President of advertising agency Rosenfeld, Sirowitz, Humphrey & Strauss from 1990 to 1992. For 11 years, until July 2012, Ms. Srere was a director of Electronic Arts Inc. During her tenure, she served on its compensation and its nominating and governance committees. Ms. Srere also served as a director of aQuantive, Inc., which was sold to Microsoft in 2007. She currently sits on the Investor and Executive Council of DCubed Group, a private market investment firm. Ms. Srere brings to the Board of Directors marketing, strategic and business leadership skills from her career in marketing and advertising. Family Relationships. There are no family relationships among any of our directors and executive officers. our Board of Directors. As Managing Partner and a co-founder of CCM, Mr. Shackelton has an indirect interest in the transaction whereby Coliseum purchased 700,000 shares of Series A Preferred Stock of the Company on June 24, 2016 for a total purchase price of $70,000,000. For additional information, please see “Certain Relationships and Related Transactions - Securities Purchase Agreement,” which is included elsewhere in this Proxy Statement. Corporate governance is typically defined as the system that allocates duties and authority among a company’s stockholders, board of directors and management. The stockholders elect the board and vote on extraordinary matters; the board is the company’s governing body, responsible for hiring, overseeing and evaluating management; management runs the company’s day-to-day operations. Our Board of Directors currently consists of 11 directors. Board Leadership Structure. Our Corporate Governance Guidelines provide that our Board of Directors is free to choose the Chairman of the Board in any manner that is in the best interests of UTI. In making leadership structure determinations, our Board of Directors considers many factors, including the specific characteristics and circumstances existing at that time, whether the role of Chairman should be separate from that of the Chief Executive Officer and, if the roles are separate, whether the Chairman should be selected from the independent directors or from management. The Board believes that no single board leadership model is universally or permanently appropriate and will periodically review its Chair selection and whether or not that selection should remain in effect. Currently, Mr. DeVincenzi serves as non-executive Chairman of the Board of Directors. The Board believes that the separation of the roles of Chairman and Chief Executive Officer provides more depth in our company’s leadership and additional strategic support to our President and Chief Executive Officer as she focuses on and navigates the business during a challenging time for our industry. In addition to his responsibilities as a director generally, the Chairman of the Board has primary responsibility for Board leadership and administration, with a focus on Board meeting leadership, strategy discussions and management performance and accountability. The Chairman of the Board presides at all meetings of the Board and of the shareholders at which he or she is present. The Chairman of the Board performs other functions and responsibilities as set forth in our Corporate Governance Guidelines or as requested by the Board from time to time. Our Corporate Governance Guidelines call for regular executive sessions of the non-management directors (those not employed by us). The Board of Directors believes that these regular executive sessions outside of the presence and influence of management ensure that non-management directors have sufficient opportunity to fully and candidly discuss ideas and issues regarding the Company, management’s performance and whether Board operations are satisfactory. The non-executive Chairman or the lead director, as applicable, will lead and preside over these non-management sessions and will organize and establish the agenda for these sessions. If the non-executive Chairman or lead director, as applicable, is absent or such positions are vacant, the independent directors will select from among them who will preside over any private sessions. the Board of Directors and discussed elsewhere in this Proxy Statement. The Board of Directors considers all relevant facts and circumstances in evaluating the independence of its members from management. Non-material business transactions conducted in the ordinary course of business are not determinative of the issue of independence. As required by the NYSE rules, the Board of Directors has made an affirmative determination as to each independent director that no relationships exist which, in the opinion of the Board of Directors, would interfere with the exercise of independent judgment in carrying out the responsibilities of a director and has affirmatively determined that each independent director meets the independence standard used by the Board of Directors. In making these determinations, the Board of Directors reviewed and discussed information provided by the directors and our management with regard to each director’s business and personal activities as they may relate to us and our management, including Ms. McWaters’ service on the board of directors of another entity for which one of the directors serves as chairman and chief executive officer. The Board of Directors also considered each director’s other relationships that do not involve us or our management such as the employment of UTI graduates in the service departments of automotive dealerships owned by an entity of which one of our directors is an affiliate and the service on the TechForce Foundation board by the spouse of one of the independent directors. “Independence” for Audit Committee and Compensation Committee Members and Audit Committee Financial Expert. As required by the NYSE rules, the members of our Audit Committee each qualify as “independent” under special standards established by the SEC for members of audit committees, and the members of our Compensation Committee each qualify as “independent” under special standards established by the NYSE for members of compensation committees. Our Audit Committee also includes at least one independent member who is determined by the Board of Directors to meet the qualifications of an “audit committee financial expert” in accordance with SEC rules, including that the person meets the relevant definition of an “independent director.” Mr. Conrad, Mr. DeVincenzi and Mr. Trammell have been determined to be audit committee financial experts. Stockholders should understand that this designation is a disclosure requirement of the SEC related to Mr. Conrad’s, Mr. DeVincenzi's and Mr. Trammell’s experience and understanding with respect to certain accounting and auditing matters. The designation does not impose upon Mr. Conrad, Mr. DeVincenzi or Mr. Trammell any duties, obligations or liabilities that are greater than those generally imposed on members of the Audit Committee and the Board of Directors, and the designation as an audit committee financial expert pursuant to this SEC requirement does not affect the duties, obligations or liabilities of any other member of our Audit Committee or the Board of Directors. Board’s Role in Risk Oversight. The Board of Directors as a whole is responsible for risk management oversight of the Company and in ensuring that management develops sound business strategies. The involvement of the full Board of Directors in setting the Company’s business strategy and objectives is integral to the Board’s assessment of our risk and also a determination of what constitutes an appropriate level of risk and how best to manage any such risk. This involves receiving reports and/or presentations from applicable members of management and the committees of the Board. The full Board of Directors continually evaluates Company risks such as financial risk, legal/compliance risk, operational/strategic risk and fraud risk and addresses individual risk issues with management throughout the year as necessary. While the Board of Directors has the ultimate oversight responsibility for the risk management process, the Board delegates responsibility for certain aspects of risk management to its committees, which are comprised of only independent directors. In particular, the Audit Committee focuses on enterprise risks and related controls and procedures, including financial reporting, fraud and regulatory risks. The Compensation Committee strives to create compensation practices that do not encourage excessive levels of risk taking that would be inconsistent with the Company’s strategy and objectives. The Nominating and Corporate Governance Committee is responsible for overseeing the Company’s corporate governance and corporate governance principles. Our Board of Directors and its committees meet throughout the year on a set schedule and also hold special meetings and act by written consent from time to time as appropriate. The Board of Directors has delegated various responsibilities and authority to different Board committees as described elsewhere in this Proxy Statement. Committees regularly report on their activities and actions to the full Board of Directors. In addition, the Corporate Governance Guidelines that have been adopted by the Board of Directors and which are discussed elsewhere in this Proxy Statement call for regular executive sessions of the non-management directors. In fiscal 2018, the Board of Directors held eight meetings. Each director attended at least 75% of the aggregate of the Board of Director meetings and meetings of committees on which such director served during the director’s tenure as a director and committee member. We currently have four standing Board committees: Audit, Compensation, Nominating and Corporate Governance, and Government Affairs and Public Policy. Each member of the Audit, Compensation, Nominating and Corporate Governance, and Government Affairs and Public Policy Committees is an independent director in accordance with NYSE standards. Each of the Board committees has a written charter approved by the Board of Directors. Copies of each charter are posted on our website at www.uti.edu under the “Investor Relations - Corporate Governance - Committee Charters” captions. We will provide copies of our Board committee charters upon request made by writing to us at our principal executive offices at 16220 North Scottsdale Road, Suite 500, Scottsdale, Arizona 85254. LTG (R) William J. Lennox, Jr. Audit Committee. Messrs. Blaszkiewicz, Conrad, DeVincenzi and Trammell served as members of our Audit Committee during fiscal 2018. The Board of Directors has determined that Mr. Blaszkiewicz is financially literate and that Messrs. Conrad, DeVincenzi and Trammell are audit committee financial experts and that each satisfies the independence requirements of the NYSE and the SEC. The Audit Committee has the responsibility for overseeing, among other things, our accounting and financial reporting processes, the reliability of our financial statements, the effective evaluation and management of our financial risks, our compliance with laws and regulations, and the effective and efficient audit of our financial statements by a qualified independent registered public accounting firm. The Audit Committee met 10 times during fiscal 2018. The Audit Committee is required by SEC rules to publish a report to stockholders concerning the Audit Committee’s activities during the prior fiscal year. The Audit Committee’s report is set forth elsewhere in this Proxy Statement. Compensation Committee. Messrs. Blaszkiewicz and Lennox and Ms. Srere served as members of our Compensation Committee during fiscal 2018. The Board of Directors has determined that each of Messrs. Blaszkiewicz and Lennox and Ms. Srere satisfies the independence requirements of the NYSE. The primary responsibility of the Compensation Committee is to develop and oversee the implementation of the Company’s philosophy with respect to the compensation of our officers. In that regard, the Compensation Committee has the responsibility for, among other things, developing and maintaining a compensation policy and strategy that creates a direct relationship between pay levels and corporate performance and returns to stockholders; recommending compensation and benefit plans to the Board of Directors for approval; reviewing and approving annual corporate and personal goals and objectives to serve as the basis for the Chief Executive Officer’s compensation, evaluating the Chief Executive Officer’s performance in light of the goals and, based on such evaluation, determining the Chief Executive Officer’s compensation; determining the annual total compensation for our Named Executive Officers; approving the grants of equity-based incentives as permitted under our equity-based compensation plans; reviewing and recommending to the Board of Directors compensation for our non-management directors; and reviewing and recommending employment agreements, severance arrangements and change in control plans that provide for benefits upon a change in control, or other provisions for our executive officers and directors, to the Board of Directors. The Compensation Committee met six times during fiscal 2018. Our Board of Directors has adopted a charter for the Compensation Committee that provides, among other things, that the Compensation Committee may, at its discretion, utilize consultants, counsel or other advisers to assist the Compensation Committee in fulfilling its duties. Pursuant to its written charter, the Compensation Committee has the sole authority to retain, obtain the advice of or terminate any such consultant, counsel or other adviser, including sole authority to approve the fees and other retention terms. The Compensation Committee retained Compensia, Inc. (“Compensia”) to assist as independent compensation consultants. For additional information on the role of compensation consultants, please see “Compensation Discussion and Analysis - Role of Compensation Consultants,” which is included elsewhere in this Proxy Statement. Other than their review and analysis of officer and director compensation or as otherwise discussed in this Proxy Statement, Compensia did not provide any additional services to us during the 2018 fiscal year. Nominating and Corporate Governance Committee. Messrs. DeVincenzi, Paige and Penske and Ms. Srere served as members of our Nominating and Corporate Governance Committee during fiscal 2018. The Board of Directors has determined that each member of the Nominating and Corporate Governance Committee satisfies the independence requirements of the NYSE. The Nominating and Corporate Governance Committee has the responsibility for, among other things, identifying individuals qualified to serve as directors of UTI; recommending qualified individuals for election to the Board of Directors at the annual meeting of stockholders; recommending to the Board of Directors those directors to serve on each of the Board committees; recommending a set of corporate governance guidelines to the Board of Directors; reviewing periodically our Corporate Governance Guidelines and recommending governance issues that should be considered by the Board of Directors; reviewing periodically the Board of Director’s committee structure and operations and the working relationship between each committee and the Board of Directors; and considering, discussing and recommending ways to improve the Board of Director’s effectiveness. The Nominating and Corporate Governance Committee also reviews and makes recommendations to the Board of Directors regarding the size and the composition of the Board of Directors. In addition, the Nominating and Corporate Governance Committee will review and consider properly submitted stockholder recommendations on candidates for membership on the Board of Directors as described below. In evaluating such recommendations, the Nominating and Corporate Governance Committee will use the same review criteria discussed below under “Director Qualifications and Review of Director Nominees.” Any stockholder recommendations proposed for consideration by the Nominating and Corporate Governance Committee must include the candidate’s name, accompanied by relevant biographical information, and must be submitted in accordance with our Bylaws to the attention of our Corporate Secretary at Universal Technical Institute, Inc., 16220 North Scottsdale Road, Suite 500, Scottsdale, Arizona 85254. The Nominating and Corporate Governance Committee met four times during fiscal 2018. Government Affairs and Public Policy Committee. Messrs. Lennox, Paige and Penske served as members of our Government Affairs and Public Policy Committee during fiscal 2018. The Board of Directors has determined that each member of the Government Affairs and Public Policy Committee satisfies the independence requirements of the NYSE. The Government Affairs and Public Policy Committee has the responsibility for, among other things, identifying, evaluating and reviewing legislative, regulatory, governmental and public policy matters and trends that may impact our strategic business goals, activities and performance; evaluating and reviewing our strategic governmental affairs and public policy mission and objectives and developing recommendations to allow our company to effectively achieve strategic business goals; providing tactical assistance to manage and to support our governmental affairs and public policy mission and objectives and achievement of strategic business goals; and reviewing the policies, practices and priorities of our political action committee. The Government Affairs and Public Policy Committee met four times during fiscal 2018. The Nominating and Corporate Governance Committee makes recommendations to the Board of Directors regarding the size and composition of the Board of Directors. The Committee reviews annually with the Board of Directors the composition of the Board of Directors as a whole and recommends, if necessary, measures to be taken so that the Board of Directors reflects the appropriate balance of knowledge, experience, skills, expertise and diversity required for the Board of Directors as a whole and contains at least the minimum number of independent directors required by the NYSE and other applicable laws and regulations. The Committee is responsible for ensuring that the composition of the Board of Directors accurately reflects the needs of our business and, in accordance with the foregoing, proposing the addition of members and the necessary resignation of members for purposes of obtaining the appropriate members and skills. To fulfill its responsibility to recruit and recommend to the full Board of Directors nominees for election as directors, the Committee reviews the composition of the Board of Directors to determine the qualifications and areas of expertise needed to further enhance the composition of the Board of Directors and works to attract candidates with those qualifications. In evaluating a director candidate, the Committee considers factors that are in the best interests of the Company and its stockholders, including the knowledge, experience and integrity of each candidate; the potential contribution of each candidate to the diversity of backgrounds, experience and competencies which the Board of Directors desires to have represented; each candidate’s ability to devote sufficient time and effort to his or her duties as a director; and any other criteria established by the Board of Directors and any core competencies or technical expertise necessary to staff committees of the Board of Directors. Directors should have a background and experience in areas important to the operations of the Company, such as business, education, marketing, finance, government or law, and should be individuals of high integrity and independence with substantial accomplishments. The Committee does not assign specific weights to any particular criteria. Rather, the Board of Directors believes that the backgrounds and qualifications of the directors, considered as a group, should provide a composite mix of experience, knowledge and abilities that will allow the Board of Directors to fulfill its responsibilities. In connection with each director nomination recommendation, the Committee considers the issue of continuing director tenure and whether the Board of Directors will be exposed to new ideas and viewpoints and will maintain willingness to critically examine the status quo. In connection with director nominations, the Committee also considers the nominees’ roles in (i) assisting with our business strategy, (ii) overseeing our efforts in complying with the disclosure requirements of the SEC and the NYSE, (iii) assisting in improving our internal controls and disclosure controls and (iv) overseeing our corporate governance and leadership structure. stockholder’s notice must be delivered to or mailed to and received by the Secretary at the principal executive offices of the Company at 16220 North Scottsdale Road, Suite 500, Scottsdale, Arizona 85254, not less than 90 days nor more than 120 days in advance of the first anniversary of the preceding year’s annual meeting; provided, however, that in the event that (i) no annual meeting was held in the previous year or (ii) the date of the annual meeting has been changed by more than 30 days from the date of the previous year’s meeting, or in the event of a special meeting of stockholders called for the purpose of electing directors, not later than the close of business on the 10th day following the day on which notice of the date of the meeting was mailed or public disclosure of the date of the meeting was made, whichever occurs first. To be in proper written form, such stockholder’s notice to the Secretary shall set forth in writing (a) as to each person whom such stockholder proposes to nominate for election or re-election as a director, all information relating to such person that is required to be disclosed in solicitations of proxies for election of directors, or is otherwise required, in each case pursuant to Regulation 14A under the Securities Exchange Act of 1934, as amended (the “Exchange Act”), including, without limitation, such person’s written consent to being named in the proxy statement as a nominee and to serving as director if elected as well as (i) such person’s name, age, business address and residence address, (ii) his or her principal occupation or employment, (iii) the class and number of shares of the Company that are beneficially owned by such person, (iv) a statement as to whether such person, if elected, intends to tender, promptly following such person’s failure to receive the required vote for re-election at the next meeting which such person would face re-election, an irrevocable resignation effective upon acceptance of such resignation by the Board, in accordance with the Company’s Corporate Governance Guidelines, and (v) a description of all arrangements or understandings between the stockholder and each nominee and any other person or persons (naming such person or persons) pursuant to which the nominations are to be made by the stockholder; and (b) as to such stockholder (i) the name and address, as they appear on the Company’s books, of such stockholder and the beneficial owner, if any, on whose behalf the nomination is made, (ii) the class and number of shares of the Company which are beneficially owned by such stockholder and the beneficial owner, if any, on whose behalf the nomination is made, and any material interest of such stockholder and owner and (iii) a description of any agreement, arrangement or understanding (including any derivative or short positions, profit interests, options, hedging transactions, and borrowed or loaned shares) that has been entered into as of the date of the stockholder’s notice to the Secretary by, or on behalf of, the stockholder or any of its affiliates or associates, the effect or intent of which is to mitigate loss to, manage risk or benefit of share price changes for, or increase or decrease the voting power of the stockholder or any of its affiliates or associates with respect to shares of stock of the Company, and a representation that the stockholder will notify the Company in writing within five business days after the record date for such meeting of any such agreement, arrangement or understanding in effect as of the record date for the meeting. While all directors are encouraged to attend our annual stockholder meetings, the Board of Directors does not have a formal policy with respect to such attendance. All directors attended last year’s annual meeting of stockholders. Stockholders and other interested parties may communicate with the Chairman of the Board of Directors, the directors as a group, the non-management directors as a group or an individual director directly by submitting a letter in a sealed envelope labeled accordingly. This letter should be placed in a larger envelope and mailed to Universal Technical Institute, Inc., 16220 North Scottsdale Road, Suite 500, Scottsdale, Arizona 85254. We have a Code of Conduct (including a Supplemental Code of Ethics for the Chief Executive Officer and Senior Financial Officers) (the “Code of Conduct”) that applies to all of our employees, including our principal executive officer, principal financial officer and principal accounting officer. This Code of Conduct is posted on our website at www.uti.edu under the “Investor Relations - Corporate Governance - Code of Conduct” captions. We will provide a copy of the Code of Conduct upon request made by writing to us at our principal executive offices at 16220 North Scottsdale Road, Suite 500, Scottsdale, Arizona 85254. As indicated elsewhere in this Proxy Statement, the Board of Directors has adopted Corporate Governance Guidelines. These Corporate Governance Guidelines are posted on our website at www.uti.edu under the “Investor Relations - Corporate Governance - Board of Directors” captions. We will provide a copy of the Corporate Governance Guidelines upon request made by writing to us at our principal executive offices at 16220 North Scottsdale Road, Suite 500, Scottsdale, Arizona 85254. In fiscal 2018, our non-management directors received a $35,000 annual retainer. Each non-management director also received an annual award under our 2003 Incentive Compensation Plan (the “2003 Plan”) of shares of the Company’s common stock equal to approximately $50,000 on the date of grant. In addition, each non-management director received reimbursement for out-of-pocket expenses, including travel expense on commercial flights or the equivalent cost of advance purchase first class commercial travel for non-management directors utilizing private aircraft. Upon election or appointment to the Board of Directors, our new non-management directors receive an award of shares of the Company's common stock equal to the annual award amount, pro-rated from the date of election or appointment. The non-executive Chairman of the Board received an additional annual retainer of $50,000. The lead director, if any, would receive an additional annual retainer of $20,000. The chairperson of the Nominating and Corporate Governance Committee received an additional annual retainer of $12,000, the chairperson of the Compensation Committee received an additional annual retainer of $15,000, the chairperson of the Audit Committee received an additional annual retainer of $20,000 and the chairperson of the Government Affairs and Public Policy Committee received an additional annual retainer of $25,000. The non-chairperson directors serving on the Compensation Committee and the Nominating and Corporate Governance Committee each received an additional annual retainer of $6,000. The non-chairperson directors serving on the Audit Committee each received an additional annual retainer of $8,000. The non-chairperson directors serving on the Government Affairs and Public Policy Committee each received an additional annual retainer of $8,000. No director received additional compensation for meeting attendance. Directors who are also officers do not receive any separate compensation for serving as directors. Our non-management directors are also eligible to participate in a nonqualified deferred compensation plan. The Company offers this nonqualified deferred compensation plan to allow the directors to set aside a portion of their income for retirement on a pre-tax basis. A non-management director may defer up to 100% of cash Board compensation earned in the calendar year. The nonqualified deferred compensation plan is more fully discussed in the Compensation Discussion and Analysis section included elsewhere in this Proxy Statement. The following table sets forth a summary of the compensation we paid to our non-management directors in fiscal 2018. Represents the aggregate grant date fair value of awards issued under the 2003 Plan computed in accordance with Accounting Standards Codification issued by the Financial Accounting Standards Board, Topic 718 (“Topic 718”). The annual grant was based on 18,797 shares at the closing price on March 6, 2018 of $2.66 per share. Mr. DeVincenzi was appointed as Chairman of the Board of Directors of the Company in September 2017. In December 2017, the Board approved annual Chairman compensation of $50,000 retroactive to the date of Mr. DeVincenzi’s appointment. Mr. Penske elected to defer $49,000 of fees into the Universal Technical Institute Deferred Compensation Plan. This amount includes $25,000 paid in fiscal 2018, which reflects one third of the initial grant of $75,000 that was awarded upon Mr. Shackelton's appointment to the Board. Pursuant to CCM’s company policy, Mr. Shackelton may not personally benefit from compensation he receives for serving as a director of any company in which CCM holds an equity interest. Mr. Shackelton has agreed that such compensation shall inure to the benefit of Coliseum Capital Partners, L.P. (“CCP”), an investment limited partnership of which Coliseum Capital, LLC (“CC”) is general partner and for which CCM serves as an investment advisor. Further, we have agreed with Mr. Shackelton to provide such compensation in cash to avoid the complexity and expense of unregistered equity issuances as well as to avoid potential accumulations of common stock by CCM and its affiliates. Indemnification. We indemnify our directors and officers to the fullest extent permitted by law so that they will be free from undue concern about personal liability in connection with their service to the Company. We have also entered into agreements with our directors, contractually obligating us to provide this indemnification to them. The Audit Committee has selected Deloitte & Touche LLP as our independent registered public accounting firm to perform an integrated audit of our financial statements for the year ending September 30, 2019 and of our internal control over financial reporting as of September 30, 2019. In taking this action, the Audit Committee considered Deloitte & Touche LLP’s independence with respect to the services to be performed and other factors that the Audit Committee and the Board of Directors believe are advisable and in the best interest of the stockholders. As a matter of good corporate governance, the Audit Committee has decided to submit its selection to stockholders for ratification. In the event that this selection of independent registered public accounting firm is not ratified by a majority vote of the shares of common stock present or represented at the Annual Meeting, it will be considered as a direction to the Audit Committee to consider the selection of a different firm. THE BOARD OF DIRECTORS RECOMMENDS THAT YOU VOTE “FOR” RATIFICATION OF THE APPOINTMENT OF DELOITTE & TOUCHE LLP. As more fully described below, all services provided by our independent registered public accounting firm are pre-approved by the Audit Committee, including audit services, audit-related services, tax services and certain other services. Audit Fees. Audit fees for the years ended September 30, 2018 and 2017 related primarily to services rendered for the integrated audit of the consolidated financial statements and internal control over financial reporting included in our Annual Report on Form 10-K and for the limited reviews of the financial information included in our Quarterly Reports on Form 10-Q. Audit-Related Fees. Audit-related fees for the year ended September 30, 2017 related primarily to the work performed by Deloitte & Touche LLP for due diligence services. Tax Fees. Tax fees for the years ended September 30, 2018 and 2017 related primarily to income tax compliance services, including technical and tax advice related to the review of tax returns. includes an annual fee paid to Deloitte & Touche LLP for information related to a registration statement completed during 2017 and an annual subscription for access to Deloitte & Touche LLP’s online database of accounting guidance issued by various standard-setting bodies in 2018 and 2017. It is expected that representatives of Deloitte & Touche LLP will be present at the Annual Meeting, will have the opportunity to make a statement if they desire and will be available to respond to any appropriate questions from stockholders. Pre-Approval of Audit Services. The Audit Committee meets with the independent registered public accounting firm prior to the audit to review the planning and staffing of the audit and approve the services to be provided by the independent registered public accounting firm in connection with the audit. (iii) that are promptly brought to the attention of, and approved by, the Committee before the completion of the audit (and such approval may be given by the Audit Committee or any member of the Audit Committee). The Audit Committee may delegate to any one of its members the authority to grant pre-approval of any permitted non-audit services that account for between $10,000 and $20,000 (and except as otherwise provided in a resolution of the Audit Committee adopted hereafter, the Audit Committee shall be deemed to have delegated such authority, such that any one member of the Audit Committee shall have the authority to grant pre-approval of any permitted non-audit services within such dollar limits). The pre-approval of any non-audit services pursuant to delegated authority or deemed approval shall be reported to the full Audit Committee at its next scheduled meeting. Approval of non-audit services to be performed by the independent registered public accounting firm pursuant to clause (b) above will be disclosed by us as required pursuant to Section 202 of the Act in the applicable reports filed with the SEC. The Audit Committee reviews the Company’s financial reporting process on behalf of the Board of Directors. The Audit Committee is currently composed of four independent directors. The Audit Committee operates under a written charter adopted by the Board of Directors that is available on the Company’s website at www.uti.edu under the “Investor Relations - Corporate Governance - Committee Charters” captions. The Audit Committee met 10 times during fiscal 2018. Management has the primary responsibility for the financial statements and the reporting process, including the system of internal control over financial reporting. In fulfilling its responsibilities, the Audit Committee meets with management and the independent registered public accounting firm to review and discuss the Company’s annual and quarterly financial statements, including the disclosures under “Management’s Discussion and Analysis of Financial Condition and Results of Operations” in the Company’s Annual Report on Form 10-K, any material changes in accounting policies used in preparing the financial statements prior to the filing of a report on Form 10-K or Form 10-Q with the SEC, and the items required to be discussed by AU Section 380, Communication with Audit Committees (“AU 380”), with respect to annual financial statements, and AU Section 722, Interim Financial Information, with respect to quarterly financial statements. The Audit Committee met and held discussions with management and the independent registered public accounting firm regarding the fair and complete presentation of the Company’s financial statements, management’s assessment of the Company’s internal control over financial reporting and the significant accounting policies applied by management in the preparation of the Company’s financial statements, as well as any alternative accounting policies. Management represented to the Audit Committee that the Company’s consolidated financial statements were prepared in accordance with accounting principles generally accepted in the United States, and the Audit Committee has reviewed and discussed the consolidated financial statements with management and the independent registered public accounting firm. The Audit Committee discussed with the independent registered public accounting firm matters required to be discussed by AU 380. In addition, the Audit Committee received the written disclosures and the letter from the independent registered public accounting firm required by applicable requirements of the Public Company Accounting Oversight Board regarding the independent accounting firm’s communications with the Audit Committee concerning independence, and discussed with the independent registered public accounting firm such firm’s independence from the Company and its management. The Audit Committee also has considered whether the independent registered public accounting firm’s provision of permitted non-audit services to the Company is compatible with its independence. The Audit Committee has concluded that the independent registered public accounting firm is independent from the Company and its management. The Audit Committee discussed with the independent registered public accounting firm the overall scope and plans for its audit. The Audit Committee met with the independent registered public accounting firm, with and without management present, to discuss the results of its audit, the evaluation of the Company’s internal controls, the overall quality of the Company’s financial reporting and other matters required to be discussed by AU 380. In reliance on the reviews and discussions referred to above, the Audit Committee recommended to the Board of Directors, and the Board of Directors approved, the inclusion of the audited financial statements in the Company’s Annual Report on Form 10-K for the fiscal year ended September 30, 2018, for filing with the SEC. We maintain the Management 2002 Stock Option Program (the “2002 Plan”) and the 2003 Plan pursuant to which we may grant equity awards to eligible persons. Management 2002 Stock Option Program. The 2002 Plan was adopted by our Board of Directors and became effective in April 2002. A maximum of 783,000 shares of common stock may be issued under the 2002 Plan, which is administered by our Compensation Committee. The 2002 Plan provides for the grant of incentive and nonqualified stock options to our employees and employees of related companies, including officers and management directors, and non-statutory options to other persons providing material services to us or related companies. A non-management director is not eligible to receive an award. As of September 30, 2018, we had issued 690,152 shares of common stock upon the exercise of options granted under the 2002 Plan. We will not make any further grants under the 2002 Plan. 2003 Incentive Compensation Plan. The 2003 Plan was adopted by our Board of Directors and approved by holders of the majority voting power of our voting stock and became effective in December 2003. The 2003 Plan was amended by holders of the majority voting power of our voting stock at the 2012 Annual Meeting of Stockholders to, among other things, increase the number of shares issuable under the 2003 Plan to 5,280,972 shares of our common stock, subject to proportional adjustment to reflect stock splits, stock dividends and other similar events. The 2003 Plan was amended again by holders of the majority voting power of our voting stock at the 2017 Annual Meeting of Stockholders to increase the number of shares issuable under the 2003 Plan to 6,280,972 shares of our common stock, subject to proportional adjustment to reflect stock splits, stock dividends and other similar events, and to provide for additional performance criteria under the 2003 Plan. The 2003 Plan provides for the issuance of incentive stock options, nonqualified stock options, stock appreciation rights, restricted stock, stock units, performance shares, performance units, performance-based awards and cash bonuses. Awards under the 2003 Plan may be granted to employees, directors, consultants and advisors to the Company or any of our subsidiaries. However, only employees (including officers and directors who are also employees) of the Company or any of our subsidiaries may receive incentive stock options under the 2003 Plan. The 2003 Plan is administered by our Compensation Committee. As of September 30, 2018, we had issued 412,293 shares of common stock upon the exercise of options granted under the 2003 Plan, at a weighted average exercise price of $19.15 per share. As of September 30, 2018, there were no shares of common stock issuable pursuant to currently exercisable options granted under the 2003 Plan. As of September 30, 2018, we had granted 2,971,805 shares of restricted stock awards under the 2003 Plan, of which 1,255,253 shares have been forfeited and no shares are still subject to restrictions. During the year ended September 30, 2018, restrictions lapsed with respect to 4,022 shares, of which 1,300 shares were withheld to settle individual participant tax obligations. As of September 30, 2018, we had awarded 2,317,272 restricted stock units under the 2003 Plan, of which 988,161 shares have been forfeited and 571,617 shares remain unvested. During the year ended September 30, 2018, 206,203 restricted stock units vested, of which 81,736 shares were withheld to settle individual participant tax obligations. As of September 30, 2018, we had awarded 313,611 performance stock units under the 2003 Plan, of which 35,746 shares have been forfeited and 277,816 shares remain unvested. During the year ended September 30, 2018, no performance stock units vested. The following table summarizes our equity compensation plan information as of September 30, 2018. Information is included for both equity compensation plans approved by the stockholders and equity plans not approved by the stockholders. 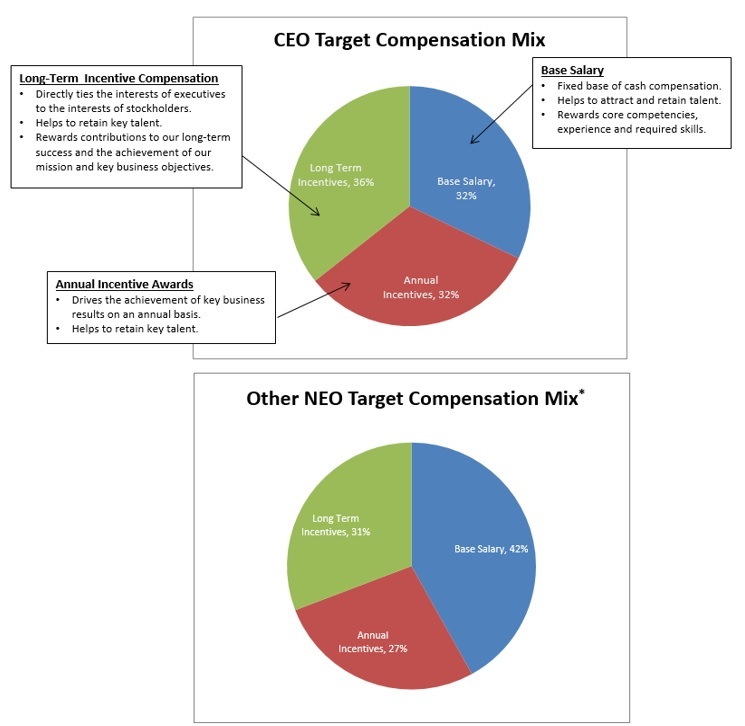 In this Compensation Discussion and Analysis, we describe the material components of our executive compensation program for our principal executive officer, principal financial officer, the three other most highly compensated individuals who were serving as executive officers of the Company as of the end of fiscal 2018, and one additional individual who served as principal financial officer of the Company during fiscal 2018 but was not serving as principal financial officer on September 30, 2018. Specifically, this Compensation Discussion and Analysis provides an overview of our executive compensation philosophy, the overall objectives of our executive compensation program and each compensation component that we provide. In addition, we explain how and why the Compensation Committee of our Board of Directors arrived at the specific compensation decisions for our executive officers for fiscal 2018. The compensation of the NEOs for fiscal 2018 is set forth in “Executive Compensation - Fiscal 2018 Summary Compensation Table” and other tables contained in this Proxy Statement. Lower student population levels as we began 2018 resulted in a 4.3% decline in our average full-time enrollment to 10,418 students for the year ended September 30, 2018. We started 10,705 students during the year ended September 30, 2018, which represents an increase of 1.2% as compared to a decrease of 6.4% for the year ended September 30, 2017. The increase in starts was primarily the result of the transformation plan initiatives and continued execution on the metro campus strategy. Our revenues for the year ended September 30, 2018 were $317.0 million, a decline of $7.3 million, or 2.3%, from the prior year. We had an operating loss of $35.3 million compared to $1.8 million for the same period in the prior year. The decrease in our operating results were due in part to the decline in revenues, and the decline in our average full-time enrollment. The decrease in revenue was partially offset by tuition rate increases. Operating results were also impacted by an increase in contract services, advertising, compensation and related costs, student expenses, professional services expense and goodwill and intangible asset impairment expense. We incurred a net loss of $32.7 million compared to $8.1 million in the prior year. During the year ended September 30, 2018, we had an income tax benefit of $3.0 million compared to $5.4 million in income tax expense for the same period in the prior year. The income tax benefit for the year was due primarily to the release of certain valuation allowance, as impacted by the provisions of the Tax Cuts and Jobs Act of 2017, which was signed into law on December 22, 2017 (“the New Tax Law”). Effective November 27, 2017, Jerome A. Grant began serving as Executive Vice President and Chief Operating Officer. Effective April 15, 2018, Sherrell E. Smith assumed the role of Executive Vice President of Campus Operations and Services. Following the hire of Eric A. Severson, Senior Vice President of Admissions, in July 2018, Mr. Smith fully transitioned leadership of the Admissions function. Bryce H. Peterson, our former Executive Vice President and Chief Financial Officer, left the Company effective May 14, 2018. In connection with his departure, Mr. Peterson is receiving severance pursuant to our Severance Plan. Effective May 14, 2018, Scott Yessner was appointed our interim Chief Financial Officer. Mr. Yessner provides his services through an agreement between the Company and Ranstad Professionals US, LLC, d/b/a Tatum, a professional services firm (“Tatum”). * Mr. Yessner is excluded from this table as he is compensated by Tatum. Supported our belief that compensation should track Company performance. Consistent with our financial results for fiscal 2018, our annual cash incentive award did not pay out at the consolidated level, and our CEO and other NEOs received 0% of target level incentive. Annual Executive Compensation Review. The Compensation Committee conducts an annual review and approval of our compensation strategy, including a review of our compensation peer group used for comparative purposes and a review of our compensation-related risk profile to ensure that our compensation-related risks are not reasonably likely to have a material adverse effect on the Company. Independent Compensation Consultant. The Compensation Committee has engaged Compensia, Inc., a national compensation consulting firm, to assist it in fulfilling its responsibilities and duties. Pay for Performance. A significant portion of each NEO's annual compensation is subject to achievement of objective performance metrics. Our executive compensation program is designed so that a significant portion of compensation is “at-risk” based on Company performance, as well as equity-based to align the interests of our executive officers and stockholders. Target Pay Competitively. Using an appropriately selected peer group of companies, we target the total direct compensation opportunities of our executive officers within a competitive range. the Named Executive Officers have share disposition restrictions in place due to the decreased value of our stock price in recent years. Executive and Senior Vice Presidents - two times base salary. Cap on Annual Incentive Award Compensation. The aggregate maximum annual incentive award that can be earned by each of our NEOs is capped at 150% of his or her target award opportunity. Hedging. Our Insider Trading Policy provides that no employee, officer or director may acquire, sell or trade in any interest or position relating to the future price of Company securities, such as a put option, a call option or a short sale (including a short sale “against the box”), or engage in hedging transactions (including “cashless collars”). Income Tax Gross-Ups. We do not provide for any 280G tax gross-up payments in any employment or change in control agreements. "Double Trigger" Change in Control Provisions. Under the change in control provisions of our severance programs and long-term incentive awards, our executive officers are only eligible to receive severance payments and benefits if they experience a qualifying termination of employment following a change in control, subject to award agreement terms. Our executive compensation program is driven by our business environment, objectives and outcomes. Consequently, we evaluate the performance of our executive officers, including the NEOs, based on their management of the Company in the context of current business and economic conditions and our performance relative to our peers. Because the NEOs have broad policy-making authority, the Compensation Committee holds them responsible for our financial performance and for upholding our values in a competitive marketplace. In this highly competitive market for top executive talent, we believe it is critical we provide our executive officers with incentives that are aligned with the interests of our stockholders, internally and externally equitable, promote a culture of innovation and results-oriented service for our students and customers, and discourage undue risk-taking. We also believe an effective executive compensation program rewards the achievement of short-term, long-term and strategic objectives that are closely aligned with the soundness of the Company and the interests of our stockholders and encourages appropriate decision-making regarding the long-term value of the Company. Therefore, we believe that a meaningful portion of each executive officer’s target total direct compensation opportunity should be “at risk” and payable only if his or her performance benefits the interests of our stockholders. We hold stockholder advisory Say on Pay votes on the compensation of our named executive officers every three years, the most recent of which occurred at our annual meeting in 2017. The 2017 Say on Pay proposal received majority support, achieving 78% approval. The Compensation Committee considers the results of our Say on Pay votes, together with the other factors discussed in this Compensation Discussion & Analysis, as it considers appropriate when it reviews and modifies the pay program and compensation packages provided to our NEOs. The Compensation Committee is responsible for overseeing the design and operation of our executive compensation program. In fulfilling this responsibility, the Compensation Committee formulates recommendations for the target total direct compensation, and each individual element of compensation, for our executive officers, including the NEOs, for consideration by and approval of our Board of Directors. In developing these recommendations, the Compensation Committee evaluates the financial and operational performance of the Company and conducts a performance review of our CEO, taking into consideration our short-term and long-term goals and objectives. The Compensation Committee also considers the annual performance review of our other executive officers, as conducted by our CEO, as a significant factor in developing the compensation recommendations for these individuals. With the assistance of a compensation consultant, the Compensation Committee also conducts an annual assessment of the competitiveness of our executive compensation program, including a review of the compensation mix to ensure appropriate pay leverage is maintained in the overall compensation package and in equity-based incentives that emphasize the creation of long-term stockholder value. In the summer of 2017, the Compensation Committee conducted its annual review of compensation for fiscal 2018, examining the base salary, annual cash incentive award opportunity and long-term incentive compensation opportunity of each executive officer, including each NEO. In September 2017, the Compensation Committee approved a new performance-based long-term incentive plan, comprised of performance units and performance cash using a total shareholder return growth measure, in addition to time-based restricted stock units. Our CEO makes recommendations to the Compensation Committee as to the base salaries, target annual cash incentive award opportunities and long-term incentive compensation opportunities of our executive officers, including the NEOs (other than herself). These recommendations are based on an analysis of relevant market data (derived from a review of peer company and survey data), as well as her evaluation of each executive officer’s performance. Conducted a change in control agreement costing analysis. Compensia serves at the direction of, and reports directly to, the Compensation Committee. A representative of Compensia attends all Compensation Committee meetings. Compensia does not perform any other services for the Company unless directed to do so by the Compensation Committee. Other than the work described above, there are no other material relationships between Compensia and the Company or its executive officers or members of our Board of Directors. The Compensation Committee has analyzed whether or not the work of Compensia as a compensation consultant has raised any conflicts of interest, taking into consideration the factors as set forth in the listing standards of the New York Stock Exchange. Based upon its analysis, the Compensation Committee has determined that the work of Compensia and any individual compensation consultant employed by Compensia and involved in providing us services on behalf of the Compensation Committee has not created any conflicts of interest. To evaluate the competitiveness of our executive compensation program, the Compensation Committee compares each compensation element, as well as the total direct compensation of our executive officers, including the NEOs, against the compensation practices of a group of peer companies. In selecting the peer group companies, the Compensation Committee considers the following criteria: (i) focus on the education services industry, education-related industry, or a counter-cyclical industry, headquartered in the United States and traded on a major U.S. stock exchange; and (ii) revenue, market capitalization, assets and headcount within a reasonable range of the Company. In 2018, Capella Education Corporation and Strayer Education, Inc., two of our compensation peer group companies, merged, resulting in Capella’s removal from our peer group during fiscal 2018. Strategic Education, Inc. (f/k/a Strayer Education Inc.), remains in our peer group. In addition to compensation peer group data, we also compile and analyze job-specific compensation survey data prepared from general industry organizations for companies with similar revenue levels. For fiscal 2018, the compensation surveys used were Mercer’s Benchmark Database, Mercer’s Human Resources Proprietary Education Network (HRPEN) For-Profit Post-Secondary Education Study, and PayFactors Survey Database. The data drawn from these surveys was combined with the data derived from the companies in the compensation peer group to create a set of composite comparison data (the “Competitive Market Data”). In the case of executive officers where compensation data was publicly available from SEC filings, the data derived from the companies in the compensation peer group was weighted equally with the compensation survey data in developing the Competitive Market Data for their positions. individual elements of compensation, for our executive officers, including the NEOs. Generally, using the data from the 50th and 75th percentiles of target total direct compensation as reference points, the Compensation Committee formulated recommendations for the amount of each individual element of compensation for each executive officer. Generally, the Compensation Committee gives greater weight to compensation data above the midpoint of the competitive market because we believe that the Company’s continued status as the industry’s choice for technical training requires a level of leadership talent that commands a premium in the current environment. Additionally, the attraction and retention of talent in the for-profit education sector has been negatively impacted in recent years by regulatory and economic pressures creating a need to pay above the median for top talent. Since the Competitive Market Data is a starting point for the Compensation Committee’s deliberations, which are influenced by several additional factors as described below, the target total direct compensation opportunities for our executive officers, as well as the amounts of each individual compensation element, may vary from the 50th and 75th percentiles of such data. We compare the positioning of our employee benefits annually using national healthcare surveys. Retirement benefits are evaluated annually against general industry standards, using data from our plan administrators (Vanguard and Newport Group). Typically, we target the median of this data to maintain competitive levels with respect to each of our employee benefits programs. Our executive compensation program is designed around the concept of total direct compensation - that is, the combination of base salary, annual incentive awards and long-term incentive compensation. In setting the appropriate level of target total direct compensation, the Compensation Committee and the independent members of our Board of Directors seek to establish each compensation element at a level that is competitive and that will attract and motivate top talent, while keeping the overall compensation levels aligned with stockholder interests and job responsibilities. The Compensation Committee believes that the mix of annual incentive awards and long-term incentive compensation was well-balanced and consistent with our executive compensation objectives as impacted by the current business environment. In addition, the Compensation Committee has determined that the relationship between performance and incentive plan payouts are within the range of competitive practices as measured each year against the performance of our compensation peer group and the corresponding compensation paid by the companies in the compensation peer group to their executive officers. Each year, the Compensation Committee reviews the base salaries of our executive officers, including the NEOs, using the deliberative process described above. In making base salary adjustment recommendations, the Compensation Committee considers our current business environment, the Competitive Market Data and each executive officer’s past performance, anticipated future contributions, role, responsibilities, skills and experience. A base salary 2% cost-of-living adjustment for the NEOs was last made in December 2015. From April 9, 2018 through May 13, 2018, we paid Tatum a weekly fee of $7,500 for Mr. Yessner’s consulting services, which totaled $37,500 for fiscal 2018. From May 14, 2018 through September 30, 2018, we paid Tatum a weekly fee of $13,500 totaling $270,000 to retain Mr. Yessner’s services as interim Chief Financial Officer. Effective October 1, 2018, we pay Tatum a weekly fee of $16,050 to retain Mr. Yessner as interim Chief Financial Officer. Mr. Peterson left the Company on May 14, 2018. The fiscal 2018 base salaries of the Named Executive Officers are included in “Executive Compensation - Fiscal 2018 Summary Compensation Table” below. During fiscal 2018, our executive officers, including the NEOs (other than Mr. Yessner, who is compensated solely through Tatum), were eligible to earn annual cash incentive awards based on the achievement of specific performance goals for the fiscal year under the 2003 Plan (in the case of Ms. McWaters) and our Management Incentive Plan (in the case of Messrs. Peterson, Grant, Smith and Freed). After considering the Competitive Market Data, the Compensation Committee increased the target annual cash incentive opportunity for Ms. McWaters from 90% to 100%. Ms. McWaters has historically participated in the 2003 Plan; however, the awards are equivalent in design to the Management Incentive Plan. *Mr. Yessner is excluded from this table as he is compensated by Tatum. The fiscal 2018 target annual cash incentive awards of the NEOs were based on our financial performance as measured by the Company’s consolidated EBIT as well as the success of select student metrics, including consolidated show rate and consolidated total population persistence. Consolidated show rate and consolidated total population persistence replaced the student metrics of graduate placement and completion rate used in fiscal 2017. Consolidated show rate provides a measure of the number of students scheduled to start school who start as anticipated. Consolidated total population persistence tracks the number of continuing students who remain in school as measured over the course of their program. For fiscal 2018, a consolidated EBIT floor was established, replacing the student metric modifier calculation used in fiscal 2017. For fiscal 2018, the consolidated EBIT floor was calculated at 10% below budget/target and must have been met or exceeded in order for participants to achieve a payout under the student metric plan components. See “Award Analysis and Results” below for the actual award calculation for fiscal 2018. Multiple award payment levels exist between the threshold, target and maximum amounts described above. *Subject to consolidated EBIT achievement. *Metrics were reduced to 0% of actual result because the consolidated EBIT was not met. (1) Mr. Yessner is excluded from this table as he is compensated by Tatum. Mr. Peterson left the Company on May 14, 2018. The terms of Mr. Peterson’s severance stipulated a prorated payout to date of termination. In September 2017, the Compensation Committee approved a new performance-based long-term incentive plan, comprised of time-based RSUs, performance units and performance cash. The performance units and performance cash awards are considered “at risk” performance-based compensation that encourages and rewards long-term performance using a total shareholder return growth measure. The performance unit and performance cash awards are tied to a two-year or three-year performance period wherein performance is measured by compound annual total shareholder return (“TSR”) calculated based on the 30-day trading average closing stock price at the beginning and the end of the performance period. The performance will reflect stock price appreciation and any dividends paid on common stock (excludes preferred stock dividends). Generally, we expect the performance period for annual performance-based awards to be three years in length. However, the timing of recent grants required a two-year performance period to bridge from the former four-year graded vesting to a three-year cliff vesting. Prior to future annual performance-based award grants, the Compensation Committee will determine the most appropriate performance period. applicable vesting date, except that the awards vest upon death, disability and termination of employment or service without cause or for good reason within one year after a change in control of the Company (as defined in the 2003 Plan and the applicable award agreements). We maintain a defined contribution plan, intended to qualify under Section 401(k) of the Internal Revenue Code, which is generally available to all employees, including the NEOs (other than Mr. Yessner), to assist them in saving for retirement. Under this plan, a participant may contribute a maximum of 75% of his or her pre-tax base salary (up to the statutorily-prescribed annual limit). Our Board of Directors may approve discretionary matching and/or profit-sharing contributions into the plan for eligible employees. During fiscal 2018, we matched 25 cents on each dollar saved up to the first 6% of eligible compensation contributed to the plan after the first year of employment. A five-year vesting schedule applies to all of our matching contributions. A participant is considered fully vested in our matching contributions after he or she has completed five years of service with the Company. Our executive officers, including the NEOs (other than Mr. Yessner), are also eligible to participate in our Nonqualified Deferred Compensation Plan. We offer this plan to allow participants to set aside a portion of their income for retirement on a pre-tax basis, in addition to the amounts allowed under the Section 401(k) plan. We view these retirement benefits as a key component of our executive compensation program because they are intended to encourage long-term service by our executive officers. We provide limited perquisites, including Company-paid premiums for life and disability insurance, a supplemental executive disability benefit, accidental death and dismemberment coverage, executive physicals, additional term-life insurance and the Executive Medical Plan (ArmadaCare), to certain of our executive officers, including the Named Executive Officers (other than Mr. Yessner). Given the rigorous demands placed on the Named Executive Officers, we have a vested interest in their proactive focus on their health and security. Based on its review of the Competitive Market Data, the Compensation Committee believes that perquisite levels provided to our executive officers are less than those provided by comparable companies. For years prior to January 1, 2018, there was an exemption from the $1 million deduction limitation if amounts payable were deemed to be “performance-based compensation” as provided for in Section 162(m) of the Internal Revenue Code and the Treasury Regulations promulgated thereunder. Our Compensation Committee used its reasonable best efforts to provide for compensation to our executive officers that would satisfy the performance-based compensation exemption. However, pursuant to the New Tax Law (for taxable years beginning after December 31, 2017 and subject to a very narrow exception described below), the performance-based compensation exemption was repealed and no longer available to be used by public companies in order to minimize the loss of tax deductions of certain compensation payable to the Chief Executive Officer and the three next highest paid individuals (each, a “specified executive”) for tax deductibility purposes under Section 162(m). It should be noted that the New Tax Law also provides that the Chief Financial Officer will now be eligible to be included as a specified executive for Section 162(m) purposes. The New Tax Law does provide for a transitional exception to this performance-based compensation exemption repeal, specifically with respect to remuneration payable pursuant to written binding contracts that were in effect on November 2, 2017 and are not subsequently modified in any material respect. This transitional exemption is very narrow and applies to limited situations. Consequently, for fiscal years beginning after December 31, 2017, no remuneration in excess of $1 million paid to a specified executive will be deductible (unless paid pursuant to an arrangement in effect on November 2, 2017 that was not materially modified in any way). Sections 280G and 4999 of the Internal Revenue Code provide that our executive officers and directors who hold significant equity interests and certain other service providers may be subject to an excise tax if they receive payments or benefits that exceed certain prescribed limits in connection with a change in control of the Company, and that we, or a successor, may forfeit an income tax deduction on the amounts subject to this additional tax. We did not provide any executive officer, including any Named Executive Officer, with a “gross-up” or other reimbursement payment for any tax liability that he or she might owe as a result of the application of Sections 280G or 4999 of the Internal Revenue Code during fiscal 2018, and we have not agreed and are not otherwise obligated to provide any Named Executive Officer with such a “gross-up” or other reimbursement in connection with the payments or benefits in connection with a change in control of the Company. Amounts payable to the Named Executive Officers as a result of a termination of employment in connection with a change in control of the Company may be reduced pursuant to provisions of the applicable agreements if they would be subject to taxes as a result of Sections 280G or 4999 of the Internal Revenue Code. We follow Financial Accounting Standard Board Accounting Standards Codification Topic 718 ("ASC Topic 718") for our stock-based compensation awards. ASC Topic 718 requires companies to measure the compensation expense for all share-based payment awards made to employees and directors, including stock options, based on the grant date fair value of these awards. This calculation is performed for accounting purposes and reported in the compensation tables below, even though our executive officers may never realize any value from their awards. ASC Topic 718 also requires companies to recognize the compensation cost of their stock-based compensation awards in their income statements over the period that an executive officer is required to render service in exchange for the option or other award. In granting equity awards to the Named Executive Officers during fiscal 2018, the Compensation Committee generally considered the potential expense of those awards under generally accepted accounting principles and their impact on our earnings per share. The Compensation Committee concluded that the award levels were in the best interests of our stockholders given competitive compensation practices among the companies in our compensation peer group, the awards’ potential compensation expense, our performance and the impact of the awards on employee motivation and retention. Currently, we have not implemented a policy regarding retroactive adjustments to any cash or equity-based incentive compensation paid to our executive officers and other employees where the payments were predicated upon the achievement of financial results that were subsequently the subject of a financial restatement. We intend to adopt a general compensation recovery (“claw-back”) policy covering our annual and long-term incentive compensation plans and arrangements once the SEC adopts final rules implementing the requirement of Section 954 of the Dodd-Frank Wall Street Reform and Consumer Protection Act. Pursuant to our equity award grant policy, we grant equity awards upon the recommendation of the Compensation Committee and with the approval from the independent members of our Board of Directors. Awards to newly-hired or promoted executive officers who are eligible to receive stock awards are proposed for approval at our Board of Directors’ next regularly-scheduled meeting following the executive officer’s hire or promotion. Our annual equity awards have historically been granted in September, but in fiscal 2018 they were granted in December. Equity award levels are based on the grant date fair value of the shares of our common stock, reduced by the present value of the expected future dividends (which restricted stock awards and restricted stock unit awards do not receive) and vary among participants based on their positions within the Company. •Executive and Senior Vice Presidents - two times base salary. Under these guidelines, shares of our common stock held directly or indirectly, as well as shares of our common stock subject to outstanding restricted stock awards and restricted stock unit awards, count towards satisfaction of the stock ownership requirements. Compliance with these guidelines is measured annually in September; if the guidelines have not been met, share disposition restrictions are imposed. Currently, the Named Executive Officers have share disposition restrictions in place due to the decreased value of our stock price in recent years. Our Insider Trading Policy provides that no employee, officer or director may acquire, sell or trade in any interest or position relating to the future price of Company securities, such as a put option, a call option or a short sale (including a short sale “against the box”), or engage in hedging transactions (including “cashless collars”). The Compensation Committee of our Board of Directors believes that our compensation policies and practices as generally applicable to the Company’s employees do not encourage excessive and unnecessary risk-taking and that the level of risk that the policies and practices do encourage is not reasonably likely to have a material adverse effect on the Company. During fiscal 2018, the Compensation Committee met in June to evaluate the long-term and short-term components of our NEOs’ compensation and determined that the incentive pay mix and associated metrics provide incentive to excel while also discouraging undue risk-taking. Ms. Srere and Messrs. Blaszkiewicz and Lennox served as members of the Compensation Committee of our Board of Directors during fiscal 2018. None of these directors were an executive officer or otherwise an employee of the Company before or during such service. Ms. McWaters serves on the compensation committee of the Board of Directors of Mobile Mini, Inc. This report of the Compensation Committee shall not be deemed to be incorporated by reference into any previous filing by us under either the Securities Act of 1933, as amended (the “Securities Act”), or the Exchange Act that incorporates future Securities Act or Exchange Act filings in whole or in part by reference. The Compensation Committee has reviewed and discussed with management the Compensation Discussion and Analysis included elsewhere in this Proxy Statement. Based on this review and the discussions with management, the Compensation Committee recommended to our Board of Directors that the Compensation Discussion and Analysis be included in the Company’s Annual Report on Form 10-K for the year ended September 30, 2018 and this Proxy Statement. LTG. (R) William J. Lennox, Jr. The following table summarizes the compensation during the last three fiscal years (as applicable) to our Named Executive Officers. The amounts reported in this "Stock Awards" column represent the aggregate grant date fair value of awards of restricted stock in 2016, and performance units in 2017 and 2018, computed in accordance with ASC 718 and does not reflect whether the recipient has actually realized a financial benefit from the award. The grant date fair value of awards of performance units is based on the probable outcome of the performance conditions to which the performance units are subject and the shares the recipient would receive under such outcome. The assumptions used in the calculations for these amounts are included in Note 14 to our Consolidated Financial Statements contained in our Annual Report on Form 10-K for fiscal 2018. The performance units granted in 2017 were the postponed second half of 2016’s transitional grant. Due to cost-cutting efforts, no other grant was made during fiscal 2017. Awards reported in 2018 represent a full annual grant for the new performance-based long-term incentive plan, comprised of time-based RSUs, and performance units. The amounts reported in the "Non-Equity Incentive Plan Compensation" column represent, with respect to Ms. McWaters, amounts earned under the 2003 Plan in 2016, and no amounts were earned in 2017 and 2018. With respect to the other NEOs, the amounts reported represent amounts earned under our Management Incentive Plan in 2016, and no amounts were earned in 2017 and 2018.
mount also includes $2,070 imputed income from group-term life insurance, $18,564 ArmadaCare medical reimbursement benefits and premiums and $4,125 computed on a matching basis pursuant to the terms of the Section 401(k) plan. The amount reported in this "All Other Compensation" column for fiscal 2018 represents $8,316 paid for meals and mileage reimbursement. The amount reported in this "All Other Compensation" column for fiscal 2018 represents $9,878 in medical premiums, $363 in dental premiums, $559 in disability premiums and $419 in life insurance premiums. This amount also includes $498 imputed income from group-term life insurance, $11,424 ArmadaCare medical reimbursement benefits and premiums, and $2,137 contributed on a matching basis pursuant to the terms of the Section 401(k) plan. This amount also includes $114,544 severance and $23,242 for medical and dental benefits pursuant to our Severance Plan. For further information, see "Potential Payments upon Termination or Change in Control" below. The amount reported in this "All Other Compensation" column for fiscal 2018 represents $12,421 in medical premiums, $424 in dental premiums, $699 in disability premiums and $524 in life insurance premiums. This amount also includes $2,828 imputed income from group-term life insurance and $14,280 ArmadaCare medical reimbursement benefits and premiums. This amount also includes $78,123 in relocation expenses. The amount reported in this "All Other Compensation" column for fiscal 2018 represents $15,221 in medical premiums, $530 in dental premiums, $909 in disability premiums and $682 in life insurance premiums. This amount also includes $3,455 imputed income from group-term life insurance, $18,564 ArmadaCare medical reimbursement benefits and premiums, $4,125 contributed on a matching basis pursuant to the terms of the Section 401(k) plan and $1,644 for an executive physical. The amount reported in this "All Other Compensation" column for fiscal 2018 represents $16,125 in medical premiums, $551 in dental premiums, $909 in disability premiums and $681 in life insurance premiums. This amount also includes $1,246 imputed income from group-term life insurance, $18,564 ArmadaCare medical reimbursement benefits and premiums, $3,972 contributed on a matching basis pursuant to the terms of the Section 401(k) plan and $3,434 for an executive physical. From April 9, 2018 through May 13, 2018, we paid Tatum a weekly fee of $7,500 for Mr. Yessner’s consulting services, which totaled $37,500 for fiscal 2018. From May 13, 2018 through September 30, 2018, we paid Tatum a weekly fee of $13,500 totaling $270,000 to retain Mr. Yessner’s services as interim Chief Financial Officer. Mr. Grant joined the Company on November 27, 2017. The following table sets forth information regarding the grant of plan-based awards to the NEOs in fiscal 2018. The "Annual Cash Incentive Awards (ACIA)" amounts reported represent the dollar value of the estimated possible payout upon satisfaction of the conditions subject to the non-equity incentive plan awards granted to the Named Executive Officers in fiscal 2018. The "Stock Awards" amounts reported represent the aggregate grant date fair value of the time-based restricted stock unit awards granted to the Named Executive Officers in fiscal 2018 and do not reflect whether the recipient will actually realize a financial benefit from the award. The assumptions used in the calculations of these amounts are included in Note 14 to our Consolidated Financial Statements contained in our Annual Report on Form 10-K for fiscal 2018. The "Performance Cash Award" amounts reported represent the possible payout upon satisfaction of the performance criteria set forth by the Board of Directors. The performance period is from December 5, 2017 through December 4, 2019 with measurement date on December 4, 2019 for the two-year grant and December 5, 2017 through December 4, 2020 with measurement date on December 4, 2020 for the three-year grant. The "Performance Unit Award" amounts reported represent possible payout upon satisfaction of the performance criteria set forth by the Board of Directors. The performance period is from December 5, 2017 through December 4, 2019 with measurement date on December 4, 2019 for the two-year grant and December 5, 2017 through December 4, 2020 with measurement date on December 4, 2020 for the three-year grant. The assumptions used in the calculations of these amounts are included in Note 14 to our Consolidated Financial Statements contained in our Annual Report on Form 10-K for fiscal 2018. Amount shown is the total estimated fair value of the award on the date of grant calculated in accordance with ASC 718. Mr. Yessner is compensated by Tatum and not eligible to participate in grants of plan-based awards. The following table sets forth certain information regarding all outstanding equity awards held by each of the NEOs as of September 30, 2018, except for Mr. Peterson, our former Executive Vice President and Chief Financial Officer, who left our Company in May 2018 and held no outstanding equity awards as of September 30, 2018. The values reported in the table have not been, and may never be, realized. Restricted stock unit and performance stock unit awards are subject to forfeiture restrictions, unless an eligible NEO (currently only Ms. McWaters) experiences a qualified retirement as described in "Potential Payments upon Termination or Change in Control." Performance stock unit awards are based on achievement of specified total shareholder return goals. For further details on our new performance-based long-term incentive plan, see “Compensation Discussion and Analysis - Compensation Elements - Long-Term Incentive Compensation” found elsewhere in this Proxy Statement. The value realized, if any, will depend on the market price of our common stock on the date a NEO eventually sells such shares once the restrictions have lapsed. Assuming continued employment with the Company, the shares of common stock subject to these restricted stock unit awards will vest 25% per year on the first four anniversaries of the date of grant. Amounts shown represent performance units granted with possible payout upon satisfaction of the performance criteria set forth by the Board of Directors. The performance period is from September 13, 2017 through September 12, 2019 with measurement date on September 12, 2019. The assumptions used in the calculations of these amounts are included in Note 14 to our Consolidated Financial Statements contained in our Annual Report on Form 10-K for fiscal 2018. Amounts shown represent the aggregate grant date fair value of the time-based restricted stock unit awards granted to the Named Executive Officers in fiscal 2018 and do not reflect whether the recipient will actually realize a financial benefit from the award. The assumptions used in the calculations of these amounts are included in Note 14 to our Consolidated Financial Statements contained in our Annual Report on Form 10-K for fiscal 2018. Amounts shown represent performance units granted with possible payout upon satisfaction of the performance criteria set forth by the Board of Directors. The performance period is from December 5, 2017 through December 4, 2020 with measurement date on December 4, 2020. The assumptions used in the calculations of these amounts are included in Note 14 to our Consolidated Financial Statements contained in our Annual Report on Form 10-K for fiscal 2018. Amounts shown represent performance units granted with possible payout upon satisfaction of the performance criteria set forth by the Board of Directors. The performance period is from December 5, 2017 through December 4, 2019 with measurement date on December 4, 2019. The assumptions used in the calculations of these amounts are included in Note 14 to our Consolidated Financial Statements contained in our Annual Report on Form 10-K for fiscal 2018. Mr. Yessner is compensated by Tatum and not eligible to participate in the equity awards. The following table sets forth certain information regarding the restricted stock awards and restricted stock units held by the NEOs that vested during fiscal 2018. Represents the market value of the shares of our common stock on the vesting date, multiplied by the number of shares that vested. We did not sponsor any defined benefit pension or other actuarial plan for the NEOs during fiscal 2018. The following table sets forth the vested account balances of the NEOs under our Nonqualified Deferred Compensation Plan for the fiscal year ended September 30, 2018. Reflects the amounts deferred for each individual into the Nonqualified Deferred Compensation Plan. These amounts are included in the Salary column of the Fiscal 2018 Summary Compensation Table. Reflects the Company's contributions to the individual's deferred compensation account. In 2018, there were no Company contributions. Reflects the fully vested and earned compensation as of September 30, 2018. Mr. Yessner is compensated by Tatum and not eligible to participate in the Nonqualified Deferred Compensation Plan. Pursuant to our Nonqualified Deferred Compensation Plan, a participant employed for at least one year is eligible for an incentive matching contribution equal to 50% of his or her plan contributions, up to the maximum “matchable” compensation equivalent to 5% of base salary. These Company matching contributions are subject to a five-year vesting schedule. Beginning in January 2013, we suspended the Company matching contribution under the Nonqualified Deferred Compensation Plan. The suspension of Company matching contributions currently remains in place. The Nonqualified Deferred Compensation Plan allows for deferral of up to 75% of base salary and up to 90% of annual bonus, as well as participant deferrals to offset any excess deferrals which are returned to the participant due to required discrimination testing under the Section 401(k) plan. Participants may elect to invest among a number of mutual fund options and participant account balances will be credited on a pre-tax basis with earnings, or losses, equivalent to the actual market performance of these investments. Participants can elect to receive payments at separation from service and/or in the form of an in-service withdrawal. Generally, accounts are valued on the last business day of the month following separation from service, death or disability, with payments made in the following month. Separation from service accounts can be paid in (i) a lump sum, (ii) annual installments over a period of up to 10 years or (iii) a partial lump sum with the balance paid in annual installments, according to a participant’s election. In-Service account elections must be made for a specific date, at least three years in the future, and can be paid in a lump sum or in annual installments over a period of up to five years, according to the participant’s election. If a participant dies, becomes disabled while employed by the Company or separates from services within 24 months following a change in control of the Company, all of his or her accounts will be paid in a single lump sum. Participants may also receive distributions in the event of an unforeseeable financial emergency resulting from (i) an illness or accident involving the participant, participant’s spouse or dependents, or a beneficiary, (ii) a loss of property due to casualty or (iii) other extraordinary and unforeseeable events that are beyond the participant’s control. Participants may request an emergency distribution from the plan up to the amount necessary to satisfy the emergency. All requests for such distributions require the approval of the Company. Effective April 8, 2014, we entered into an employment agreement with Ms. McWaters that provides for the terms and conditions of her employment as our Chief Executive Officer. The employment agreement had an initial term of three years and automatically renews for successive three-year terms thereafter, unless either party gives written notice to the other 180-120 days prior to the end of the then-current term of intent not to renew the agreement. The agreement provided for a base salary of $709,000 per annum, which is reviewed annually by our Board of Directors and was last increased to $737,644 in fiscal 2016. The agreement also provides for an annual bonus based on performance as determined and approved by our Board of Directors and provides for other benefits and perquisites as established and made available from time to time by our Board of Directors. Equity awards will be granted in the discretion of and as determined and approved by our Board of Directors, and, unless we and Ms. McWaters agree otherwise, any stock unit awards granted to Ms. McWaters will include a provision that if Ms. McWaters experiences a qualifying “retirement” (as defined in the agreement), then any portion of such awards that are scheduled to vest within 12 months following such retirement will continue to vest in accordance with their terms as if Ms. McWaters were still employed, notwithstanding any continuous employment or services requirements applicable generally under any equity plan or award, subject to Ms. McWaters’ continued compliance with certain covenants and subject to having signed and not revoked a release in favor of the Company. The employment agreement further provides for certain payments and benefits in the event of Ms. McWaters’ termination of employment under certain specified circumstances, including in connection with a change in control of the Company. For further information, see “Potential Payments upon Termination or Change in Control” below. The agreement includes confidential information and covenant not to compete provisions. Each of the NEOs (with the exception of Mr. Yessner) is eligible to receive certain payments and benefits in connection with his or her termination of employment under various circumstances, including following a change in control of the Company, under his or her employment agreement or other applicable agreements, and under the terms that apply to our outstanding restricted stock and restricted stock unit awards. Mr. Peterson, our former Executive Vice President and Chief Financial Officer, left our Company in May 2018 and is receiving severance under our Severance Plan. post-employment compensation arrangement are described below. The actual payments and benefits to Mr. Peterson pursuant to his post-employment compensation arrangement are described below. Along with the payments and benefits described in a NEO’s individual post-employment compensation agreement and equity award agreements, he or she is also eligible to receive any benefits accrued under our broad-based benefit plans, in accordance with the terms of those plans and policies. The employment agreement with Ms. McWaters provides for certain specific payments and benefits under certain circumstances, including in the event that her employment is terminated by us without “cause” or by her for “good reason” (as these terms are defined in the agreements), including in connection with a change in control of the Company. Non-renewal of the employment agreement will also result in the receipt of severance payments and benefits. The death or disability of the NEO also triggers certain payments and benefits. Generally, each provides for a continuation of base salary payments for a specified period following a termination of employment. Additionally, upon a qualified retirement, any stock unit awards scheduled to vest within 12 months following such retirement will continue to vest according to their terms. As a condition to any such payments and benefits, the NEO must first execute a waiver and release of claims in favor of the Company. Twelve months of paid health benefits continuation and outplacement services. We entered into these agreements with Messrs. Peterson, Grant, Smith and Freed to facilitate our ability to retain the services of these NEOs in a competitive marketplace that commonly offers such protections. addition, in this situation he will receive 12 months of paid health benefits continuation and Company-paid outplacement services. In the event that Mr. Smith’s employment is terminated without “cause” following a change in control of the Company, he will be eligible to receive payments and benefits only as provided under his change in control agreement with us, and not pursuant to the Addendum Letter. Twelve months of outplacement services. The following tables show the estimated payments and benefits payable to each NEO (with the exception of Messrs. Yessner and Peterson) under various scenarios related to a termination of employment, including in connection with a change in control of the Company. The tables assume that such termination of employment occurred on September 30, 2018, and include the estimated payments and benefits payable pursuant to the Severance Plan. The actual amounts that would be paid to any NEO can only be determined at the time of an actual termination of employment and may vary from those set forth below. The estimated payments and benefits set forth below are in addition to any retirement, welfare and other benefits that are available to our employees generally. Mr. Peterson left our Company in May 2018. Mr. Peterson is receiving severance pursuant to our Severance Plan as set forth below. Represents 24 months of previous base salary for Ms. McWaters. Represents 12 months of base salary for Messrs. Grant, Smith, Freed and Peterson. Represents actual bonus earned pro-rated through termination date for all NEOs for all applicable columns except for termination of employment following a change in control of the Company. For terminations of employment following a change in control of the Company, represents target bonus through termination date and two times target bonus for Ms. McWaters. Represents all unvested performance cash target awards which become fully vested upon a change in control. In the event of a NEO’s death or disability, the possible payout would pro-rate on the date of death or disability upon satisfaction of the performance criteria set forth by the Board of Directors. Represents 150% of the value of 24 months of payment of medical, dental, vision and ArmadaCare insurance premiums for Ms. McWaters. Includes reasonable outplacement benefits, and in the event of death, life insurance benefits of $800,000. If separation is the result of disability, Ms. McWaters would also be eligible for disability insurance benefits under the Company's employee benefit plan. If separation is the result of death this amount reflects 150% of 24 months of payment of medical, dental, vision and ArmadaCare insurance premiums for Ms. McWaters' spouse and child. Represents all unvested restricted stock and restricted stock unit awards which become fully vested and exercisable upon a change in control of the Company or the NEO’s death or disability. Performance units become fully vested on the date of a termination without cause following a change in control. Performance units possible payout would pro-rate based on the date of death or disability upon satisfaction of the performance criteria set forth by the Board of Directors. Amounts reported represent the aggregate fair market value of restricted stock that have not vested and grant date fair value of performance unit awards. Ms. McWaters meets retirement criteria for which unvested restricted stock unit and performance unit awards scheduled to vest within 12 months following a qualified retirement, would continue to vest. Mr. Yessner is compensated by Tatum. Represents the value of 12 months of payment of the employer paid portion of medical and dental benefits for Messrs. Grant, Smith and Freed for a change in control, and represents 140% of the same value for termination of employment without cause. Includes reasonable outplacement benefits, and in the event of death, life insurance benefits of $800,000. If separation is the result of disability, the NEO would also be eligible for disability insurance benefits under the Company's employee benefit plan. Represents all unvested restricted stock and restricted stock unit awards, which become fully vested and exercisable upon a change in control of the Company or the NEO's death or disability. Performance units become fully vested on the date of a termination without cause following a change in control. Performance units possible payout would pro-rate based on the date of death or disability upon satisfaction of the performance criteria set forth by the Board of Directors. Amounts reported represent the aggregate fair market value of restricted stock that have not vested and grant date fair value of performance unit awards. (10) Mr. Peterson left the Company on May 14, 2018. Represents the value of 12 months of payment of the employer paid portion of medical and dental benefits and represents 140% of the same value for termination of employment without cause. Mr. Peterson did not utilize outplacement services and was, therefore, not paid that benefit. Total amounts payable to Ms. McWaters would be whichever of the amounts, either the full amount or such lesser amount as would result in no part of the payments being subject to the excise tax, result in employee's receipt on an after-tax basis of the greater amount. Total amounts for all other Named Executive Officers may be reduced to the extent necessary so that the amount payable is not subject to excise tax under Section 4999 of the Internal Revenue Code. For the fiscal year ended September 30, 2018, the median of the annual total compensation of all employees of our Company (other than our President and Chief Executive Officer) was $86,948, and the annual total compensation of our President and Chief Executive Officer was $1,322,688. Based on this information, for fiscal 2018, the ratio of the annual total compensation of our President and Chief Executive Officer to the median of the annual total compensation of all other employees was estimated to be 15.2:1. We believe this ratio is a reasonable estimate calculated in a manner consistent with SEC rules based on our payroll and employment records and the methodology described below. The SEC rules for identifying the median compensated employee and calculating the pay ratio based on that employee’s annual total compensation allow companies to adopt a variety of methodologies, apply certain exclusions, and make reasonable estimates and assumptions that reflect their compensation practices. As such, the pay ratio reported by other companies may not be comparable to the pay ratio reported above, as other companies may have different employment and compensation practices and may utilize different methodologies, exclusions, estimates, and assumptions in calculating their own pay ratios. We selected the first day of our fourth fiscal quarter, as the date upon which we would identify the “median employee” because it enabled us to make such identification in a reasonably efficient and economical manner. To identify the “median employee,” we considered the prior trailing 12 months of W-2 wages as of July 1, 2018 for our consistently applied compensation measure because we believe that this measure reasonably reflects the annual compensation of our employees. No cost of living adjustments were applied, and no jurisdictions were excluded. Once we identified the median employee, we totaled all of the elements of the employee’s compensation for fiscal 2018 in accordance with the requirements of the applicable rules of the SEC, and consistent with the calculation of total compensation of our CEO in the Fiscal 2018 Summary Compensation Table. The Board of Directors knows of no matters, other than the proposals presented above, to be submitted to the Annual Meeting. If any other matters properly come before the Annual Meeting, it is the intention of the persons named in the proxy card enclosed with this Proxy Statement to vote the shares they represent as the Board of Directors may recommend. Beneficial ownership is determined in accordance with the rules of the SEC and generally means that a person has beneficial ownership of a security if he, she or it possesses sole or shared voting or investment power over that security, including options and warrants that are currently exercisable or exercisable within 60 days of January 2, 2019 and RSUs that are currently vested or will be vested within 60 days of January 2, 2019. Shares issuable pursuant to options, warrants and RSUs are deemed outstanding for computing the percentage of the person holding such options, warrants or RSUs but are not deemed outstanding for computing the percentage of any other person. Except in cases where community property laws apply or as indicated in the footnotes to this table, we believe that each stockholder identified in the table possesses sole voting and investment power over all shares of common stock and Series A Preferred Stock shown as beneficially owned by the stockholder.